Imported Parma ham along with slices of fresh mozzarella cheese, topped with basil and olive oil. 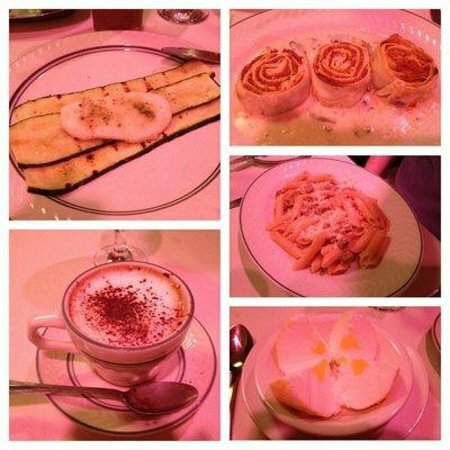 Slices of fresh mozzarella cheese grilled and served over a bed of grilled zucchini. A unique fish stew of shrimp, squid and mussels, simmered with garlic, rosemary, white beans and garlic. Fresh PEI mussels steamed in white wine, garlic, olive oil and parsley. Top neck clams on the half shell, topped with bacon, prosciutto, roasted red peppers and breadcrumbs. Whole milk mozzarella cheese folded in bread, deep fried and laced with anchovy sauce. Mild Italian sausages, grilled and served over a bed of cannellini beans cooked with onions and tomato. Grilled Italian sausage, shrimp and tortellini served on a bed of sweet red bell pepper sauce. 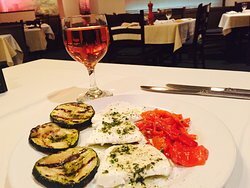 Fresh slices of mozzarella cheese served with roasted red peppers and grilled zucchini in a basil, olive oil and garlic dressing. Roman style garlic bread topped with fresh tomato, celery basil and olive oil. 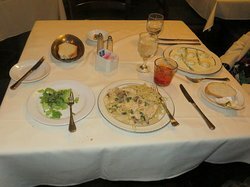 Pasta entrees served with a green house salad. Small pasta tubes cooked with chopped mild Italian sausage in a vodka and tomato sauce. Homemade noodles in a sauce of shrimp, squid, mussels, white wine, garlic and tomato. Homemade ravioli stuffed with roasted chicken and cooked in a sauce of Fontina cheese, Gorgonzola, tomato and cream. 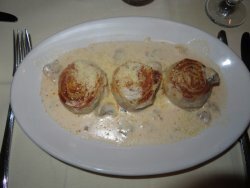 Homemade pasta stuffed and rolled with ground pork, ground veal, garlic and baked in a mushroom and cream sauce. Veal stuffed tortellini in a sauce of ham, peas, mushrooms and cream. Homemade noodles seasoned with a ragu of ground beef, sausage, vegetables, red wine and tomato. Homemade pasta filled with fresh spinach and ricotta cheese in a light tomato sauce. 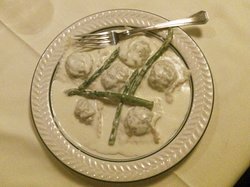 Homemade ravioli filled with asparagus and ricotta cheese in an asparagus, cheese and cream sauce. 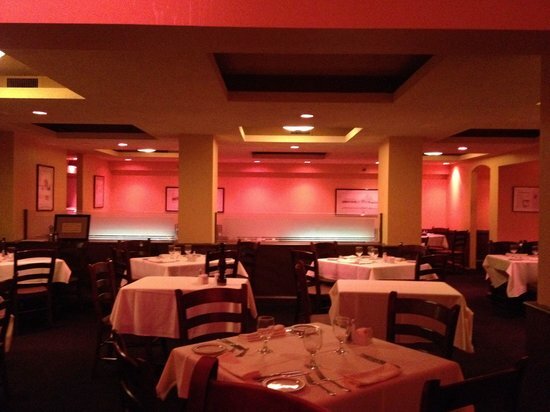 Fish, meat and poultry entrees served with a salad and a choice of vegetables or linguine aglio e olio. Grilled breast of chicken and mild Italian sausages served over a bed of green and red bell peppers with onions and cream. Boneless breast of chicken lightly breaded and baked with mozzarella cheese and tomato sauce. Lean pork chop stuffed with spinach and gorgonzola cheese, cooked in a brandy, marsala wine and cream sauce. 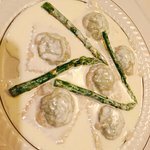 Veal scaloppini sautéed and topped with spinach, mozzarella cheese and baked in a white wine sauce. Fresh fillet of salmon prepared in a sauce of scallions, asparagus, sage, brandy and cream. 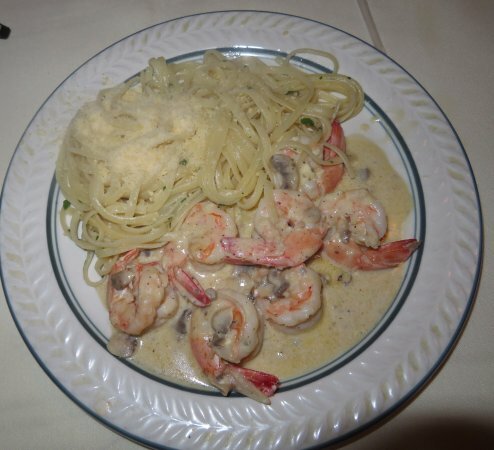 Jumbo gulf shrimp in a garlic, gorgonzola cheese and mushroom sauce. 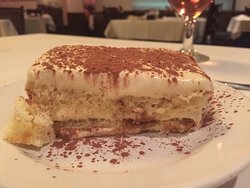 Veal scaloppini sautéed with white wine and butter, topped with ham and mozzarella cheese and lightly baked. Choice baby lamb chops grilled to taste and flavored with olive oil, garlic and rosemary. A firm white sweet fish, sautéed with butter, white wine, clam juice and arugula. Two lump crab cakes (6oz.) cooked on a special lava stone griddle, served with a pesto sauce on the side.